Rob Ryan is an artist who has alliteration in his name and uses the words you, me, us and we repetitively in his self-penned stories. You may ponder whether he’s the most romantic man in the world or just a visual artist with a soul of a poet. Be that as it may, one thing is for sure: Rob Ryan is a man of many talents. 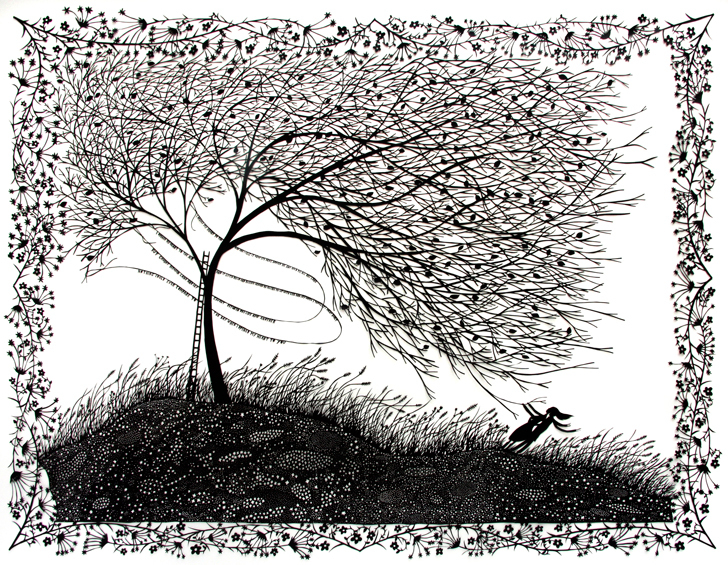 Even though most of Rob Ryan’s art is physically flat it has emotional depth. He gives creative treatment to paper, cutting blank sheets into little stories so touching there should be a sobbing alert. Or how does ”These same stars and this same sky, hang over both you and I. In my dreams and in my heart, they help us feel less far apart,” sound? Hopelessly romantic, Rob Ryan’s narratives would make great wedding vows. Whereas the little stories move you emotionally, the intricate paper cuts do the same literally. You can not help going closer to see if everything has REALLY been cut out and if the art pieces REALLY consists of only one sheet of paper. ”How the heck did he do this?” The answer is a scalpel and superior concentration. Rob Ryan doesn’t get stuck behind the operation table, but goes around as the Handy Manny of arts designing purses with Lulu Guinness and spreading his love around homes with kitchenware. He’s also done ceramics, hanky designs and has his signature tapes. Lacelike trimmings and flower adornments are the key to Rob Ryan’s paper cuts, but not merely for fetishist reasons. Adding interwoven ornaments here and there is actually a decorative way to make sure the artwork won’t fall apart. Despite their functional purpose, the microscopic ornamentations also add to the sweetness of the artwork making you go “aww” one more time. Rob Ryan’s “The Stars Shine All Day Too” is at the Air Gallery open until the 20th November 2010. “Your Job Is To Take This World Apart And Put It Back Together Again…But Even Better” shows at the Shire Hall Gallery until the 9th of January 2011.